the neck, the back of hands, the area around the eyes, décolleté etc and for those who want to refresh the skin but do not yet have really deep lines. A 1 mm dermaroller does reach the dermis and trigger collagen. You can also for example use a 1 mm roller on your face and then treat the wrinkles around the lips and on the forehead individually with a 1.5 mm dermastamp (a 1.5 mm dermastamp is usually too long for the area around the eyes and you may end up with bruises). or scars. It is excellent for pigmentations (except for dermal melasma and other deep pigmentations) and post acne spots. Yes, you can use a dermaroller and a dermastamp during the same session. Stamp the fold densely every three weeks. It may stay red for hours or even days so if you do not want to walk around with two red lines, stamp only one side and when it heals, stamp the other. Roll it every 10-14 days with your 1 mm roller as well. However, there is some evidence that certain LED light of certain frequency and intensity can help diminish acne. A 1 5 mm dermastamp is too deep for the neck area. The skin is not very thick here. You can combine it with a 0.5 mm dermastamp if you are primarily concerned about the "rings". If your concern is more an overall sagging of the skin, you can combine the 1 mm roller with the 0.5 mm roller. From what you described, you have certainly penetrated deep enough. A 1. 5 mm dermaroller will always penetrate to the dermis. Concerning the other question: The fillers are injected deep into the dermis so it is wise to avoid really long needles on the face, such as 2 mm, respectively not rolling or stamping with them directly over the areas with the filler. If the needles reach the filler, it could theoretically speed up the diminishing of the filler. There is no other reason or problem. No, this is not true at all, and we have written about this already here & there. White Lotus' business model does not allow for the sale of vitamin products, due to EU legislation. Hence their demonization of vitamins. They focus on the "magical thinking" part of the market, whereas we chose to focus on the rational thinkers. White Lotus hopes to capture some of our clientele by frightening them, claiming that our products may cause liver failure etc. We have explained many times before why that is complete nonsense. But of course it's up to you who you want to believe. We are a scientific company, with us you'll get nothing but scientifically proven methods and products. Some people have a built-in aversion against science and gravitate towards philosophies and beliefs instead, even when those beliefs and philosophies have little to no basis in reality (science). I suggest a 1 mm regular dermaroller. Roll densely every 10-14 days. Do not push the needles too much into your Adam's apple. You can use a dermaroller on that area, but only gently, not applying much pressure. Apply a little of our Infadolan ointment right after rolling and a few days after (for as long as the skin is dry after dermarolling). You can apply them as you suggested but these two should not mix and the more apart you apply them the better. The two lines you are talking about are skin folds. Another improvement you can try to achieve is to increase the collagen and the skin thickness in the fold. That is not going to fix the actual underlying cause of the fold but it might make the fold a bit less prominent (it is certainly not going to disappear though). A lot of new collagen has to be produced so this is a long-term project and you will need patience. Perhaps the best solution is to buy 1.5 mm dermastap for the folds because a dermastamp is more targeted. Stamp the folds densely. Applying every product on a daily basis is not always a good idea. The more is not always the better and especially Tretinoin can irritate the skin if applied too frequently or too much. The other two products should not be applied at the same time so applying them in turns is the best. The routines I have suggested in that forum posting are just a suggestion and people can adjust it to their own preferences and liking. There is no problem if you decide to apply it more frequently. Yes, it is perfectly OK to keep all the products in the fridge. I cannot answer the question about the shelf life by giving you an exact number of days but all cosmetic products and many other products will last a lot longer if your store them in a cool place. If you are prone to acne, then apply Infadolan only after stamping. Otherwise just a little for a few days. Camellia oil is also moisturizing so it is OK. If you have no pigmentations or post acne spots then you do not need Tretinoin. Vit. C is necessary for collagen production but if you are young and you eat healthily, it is not absolutely necessary for dermarolling. No, you do not have to change your cleanser. Yes, you can use all of them in the same month as you described. If your skin remains red or tender for more than several hours after rolling with the 0.5 mm roller, reduce the frequency of rolling with it. 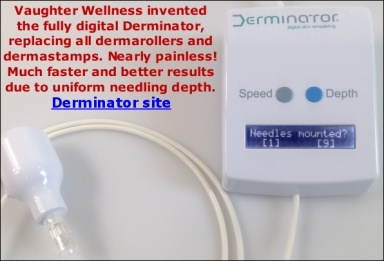 Deathfalcon, use a 0.5 mm regular dermaroller and a 1.5 mm dermastamp (with 35 needles) but you should try it on a very small area of your skin for two months to find out how your scars react. Use the 0.5 mm dermaroller (twice a week) on a small area of your skin. On another small area, use the 1.5 mm dermastamp (every three weeks). If it turns out OK then after two months you can start on larger areas and combine those two. Eight weeks is sufficient time to start with microneedling. I recommend a 1.5 mm dermastamp with 35 needles and the 0.1 % Tretinoin cream (we sell it). The scar will get red after stamping and Tretinoin will also make it temporarily red. Stamp it densely every three weeks and apply Tretinoin every second day. Infadolan ointment is suitable for dermatamping aftercare. You can also apply a little Infadolan daily onto the scar. It can be applied on top of Tretinoin. Once a week (or so), apply a thick layer of Infadolan and cover it overnight with food wrap. Remove the foil in the morning and remove excessive Infadolan to avoid your clothes getting greasy.